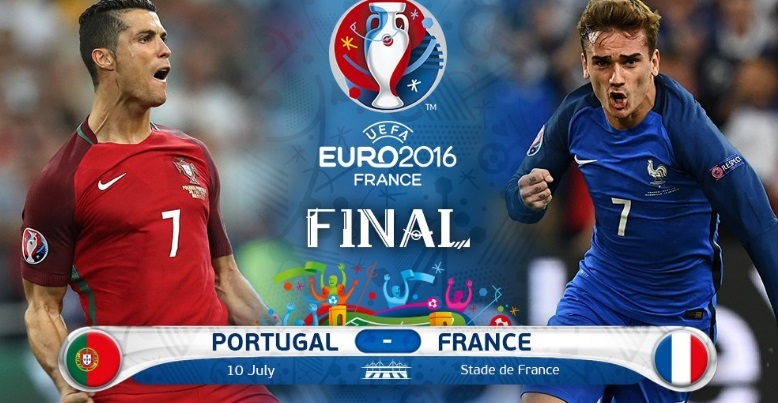 Portugal vs France UEFA EURO Final 2016: Preview, live stream, Scores, prediction, TV Schedule, Euro 2016 Watch Online Live Soccer and TV Listings. France will battle it out with Portugal for another major trophy in their home soil in the Euro 2016 final at Stade de France on Sunday night. Didier Deschamps’ men overcame Germany 2-0 in the semifinals on Thursday to make it to their fourth major tournament in front of their home crowd. France were twice the European Champions – in 1984 they hosted and 2000 co-hosted by Belgium and Netherlands. They were also the hosts when they won their only FIFA World Cup title in 1998. Portugal on the other hand didn’t break a sweat to defeat Wales 2-0 in the semifinals. It seems like Fernando Santos got his tactics right for the first time in the tournament. The win against Wales is also Portugal’s first ever in this competition inside the regulation 90 minutes. Portugal have never won a major tournament in their footballing history. They finished as runners up in 2004 after losing to Greece in front of their home fans by a single goal. They were also semifinalists on three occasions – 1984, 2000, 2012. Fernando Santos is hopeful on the fitness of Pepe, who missed the semifinal clash against Wales. There are no others players missing through injury or suspension and Santos is expected to field a similar line-up he used in the semifinal. Rui Patricio – Guerreiro, Pepe, Fonte, Soares – Mario, Sanches, Danilo, Silva – Nani, Ronaldo. Deschamps’ French national team has a clean bill of health and changes are hardly expected after a solid display against Germany in the semifinals. He is likely to field a 4-2-3-1 formation with Griezmann in the number 10 role with Payet and Sissoko in support. Lloris – Sagna, Umtiti, Kolscielny, Evra – Matuidi, Pogba – Sissoko, Payet, Greizmann – Giroud. These two sides had met in the European Championships – in 1984 and 2000. Both these clashes were in the semifinals and both the editions when France were crowned Champions. Interestingly either of these ties were won by France in the added extra time. Their only other meeting in a competitive match was in the round of 1996 FIFA World Cup in Germany. Again in the semifinals at Munich, a penalty by Zinedine Zidane send France into the semifinals. Portugal finished the tournament fourth after losing the third-place play-off to Germany. While France lost the finals in penalty shoot-out to Italy, a match which marred by dodgy refereeing decisions and infamous head-but by Zidane on Marco Materazzi. France are on an 8 match winning run against Portugal across all formats. They have a strong record at home after winning in 12 of the 15 games, while losing just twice. If we have to go by the history, France are heavy favourites to win this Euro 2016 final against Portugal. Even if we compare their recent performances, France will once again edge Portugal by a wider margin. Moreover Griezmann is on fire after scoring 5 goals in the knock-out stages and Hugo Lloris looks almost unbeatable. While Ronaldo factor will certainly come into play here. The Real Madrid super star will be keen to end his international career with a major trophy with his national team and will be fired up for this final clash. But the Selecao will require other players to perform, because I believe Ronaldo can’t do it all alone. France are certainly the favourites to win this one, but I expect Portugal to give them the toughest test. I also believe this match might not be decided within regular time, we are likely to see extra time and maybe penalties to decide the winner in this penultimate clash.